We don’t know about you guys but this winter seems to have flown past. Perhaps the recent spell of nice weather and pumping waves have led us into a false sense of security but we are hyped for the upcoming 2019 surfing season here at Splash Surf Centre. There is still a little while to go until the water warms up to the comfortable surfing temperature we know and love here in Jersey during the summer however below is a list of little tips and tricks to maximise the stoke on those winter sessions! Surfing in the winter can be cold, hard and heavy, but thats part of the thrill. It’s also a great boost to the day and certainly gets the blood flowing. That being said it’s always wise to go in with a buddy to keep an eye on each other to share the stoke, as well as to help out if any unfortunate circumstances were to occur. Despite the seemingly summery weather we have recently had the water is actually at its coldest around now. Despite this a good combination of winter wetsuit, hood, boots and gloves can cope with even the most baltic of conditions, ensuring you stay warm and toasty throughout you're surf. No matter what try and keep moving in the water. Wether paddling about, rubbing your hands, wiggling your feet. Anything to keep the blood flowing will help fight off the cold, improve circulation and help you catch as many waves as possible. Sometimes it’s important to tune into yourself and understand your body’s feelings. We have all been there, facing perfect Jersey waves, a seemingly endless line of ridable waves that you never want to end. However you need to listen to yourself, if you feel yourself getting too cold or tired to properly paddle for waves or get out back, it might be time to head back to land. After all we want to keep surfing fun and safe! What a better way to fight off those winter blues than to book in with Splash Surf Centre for your kids summer camp, a private or family lessor or perhaps even a birthday party! Having an exciting adventure booked with our fully trained, professional and dedicated staff will surely help the remainder of winter to fly by in excitement and anticipation to get riding the waves with us! Pictured is big chief Chester on an absolute winter bomb at low tide splash! Proof that you don’t need to go far for world class waves and great times! The drop in is the main violation of surf ethics. It’s the one we see way too often.Basically, it means “stealing” somebody else’s wave Jersey. Quality waves are meant to be ridden by only 1 surfer. This way the lone surfer can enjoy specific powerful areas of the wave, where only 1 surfer can fit. but how do you know if it’s your wave at the Splash or somebody else’s? When you paddle for a wave, look on both sides (right and left) before you take off. If a surfer is catching the wave further inside, closer to the peak, that surfer has priority. If you are closer to the peak ( where the wave is about to break) then you will be the one with the longest ride, so you have priority. Rent surfboards and wetsuits from the Splash Surf Centre located in front of Jersey’s best surf break (Watersplash). Our fleet of boards and top quality O’Neill wetsuits cater for all abilities. Talk to us and we will help you find the right board. Our boards are designed to be stable for learners and to be especially buoyant which makes it easier for you to catch waves. Hard and soft boards available and we are happy to do swap outs on the weekly rentals so feel free to start with beginner boards and as you progress or just want to freshen things up pop in and try something else. We have hire boards for various skill levels, winter and summer O’Neill wetsuits. Super excited for another great week at the Splash Surf Centre- its crazy how quickly summer whizzes by working here! From installing fins and trying out our awesome new hard-bottom foamies (which come in all the bright colours of the rainbow) to treating weever fish stings, being eco-warriors and of course teaching newbies the joys of surfing every day, there's never a dull moment! Our team is having a blast meeting new people who are trying out surfing for the first time, and seeing familiar faces who've been well and truly bitten by the surf bug. Our whole season is shaped by the people we teach and have fun with every day, so a big shout out to everyone who comes and spends time with us- you guys are the heart and soul of our School! Having worked here for 3 years, one of my favourite things is to see people I remember from my first season back in the water with us, and to see how much they've improved over the years. The surf community here in Jersey is so great and its wonderful to see people that we've taught becoming a part of that community, surfing by themselves and loving what they're doing. Another one of my favourite things is seeing someone catch and ride a wave for the very first time- the look of pure joy is unmistakeable and completely infectious, and being part of someone's first ever surf session is a very special experience which I feel privileged to share. I love talking with beginners to find out what made them want to try surfing, and to see people from every walk of life feeling the same excitement at their first wave and coming together through their shared enjoyment of the surf. If you're keen to come and get involved, if you want to enjoy the beauty of our island break and its stunning beaches in crystal clear water with your friends and fun-loving instructors, give us a call! We can't wait to meet you so you can love the surf as much as we do! We have just got a perfect new setup to capture the picturesque west coast waves that right outside the Splash. Being the most popular place in Jersey for a great surf on a perfect wave we wanted to give everyone 24hr access to check whether or not the waves are absolutely pumping! So don't forget to hit the Splash Surf website to check the up to date live feed of the beautiful St. Ouens bay waves before heading down for a ripping sesh! In the past weeks loads of kids have had the experieence to learn how to surf and make new friends and enjoy the warm sea, the kids and adults have enjoyed every step of the way and so have we. as we know surfing is THE BEST and the kids and adults have absolutely loved it. Everybody learnt very quickly and surfed the waves brilliantly! it has been a great expirence for them but aslo for us to see how they perform in something new and fun, as well as playing games on the beach and doing really fun activities throughout the days. Its great to see that everyone is happy and ready to surf! Thankyou everyone, keep surfing and smiling! This is a surf club open to all ages and abilities. We focus on improving your techniques. ocean awareness, fitness and water safety. Making the most of Jersey's heat wave! What an incredible start to the week with Jersey hitting record breaking temperatures for Mid June. The +30 degree days weren't wasted down here at the Surf center as we had both our children & adult Splash Clubs, a surf yoga lesson and also been crazy busy organising all our summer camps for the fast approaching season! This hot weather didn't just make all the locals flock to the beach but we have officially got all our 2017 staff back and ready for the season! They're all super stoked to be working down at the Splash Surf center for the summer and what a great team we have got for it! With a collection of both locals and people from all over the world they will be sure to make your surf experince a memorable one in the beautiful waters of Jersey! MegaSUP holds up to 8/10 people people, great for birthdays, hen or stag doos, team building actitvities or simply with your friends ... it's even great as a sunbathing deck when the surf is flat. Everyone together on the boardt the same time. Guaranteed fun ! 2hr Surf Party which includes 1.5hr Surf lesson and fun beach games . See our Parties in Action! After two weeks of being in the pumping Jersey waves the Splash Surf Clubs are absolutely loving it! We are so excited to be teaching both the children and adult camps that come on a weekly basis for the month of May. They are doing a fantastic job with both thoery and practical components. The surf in Jersey has been absolutely incredible lately and we have been so busy down at the Surf school getting prep'd for the summer 2017 season ahead! We do still have a few spots for our June Surf camps which are held on Tuesday evenings (children 5pm-6pm & adults 6pm-7pm) and as well Saturdays (children 11am-12pm & 12pm-1pm) all £80 for the month. Be sure to register soon before we get fully booked! What a pumping day it was down at the surf shack this past Sunday! The sun was shining all day and we had a great turnout of a total of over 50 children throughout the day. There was so much excitement in the water and on the beach. 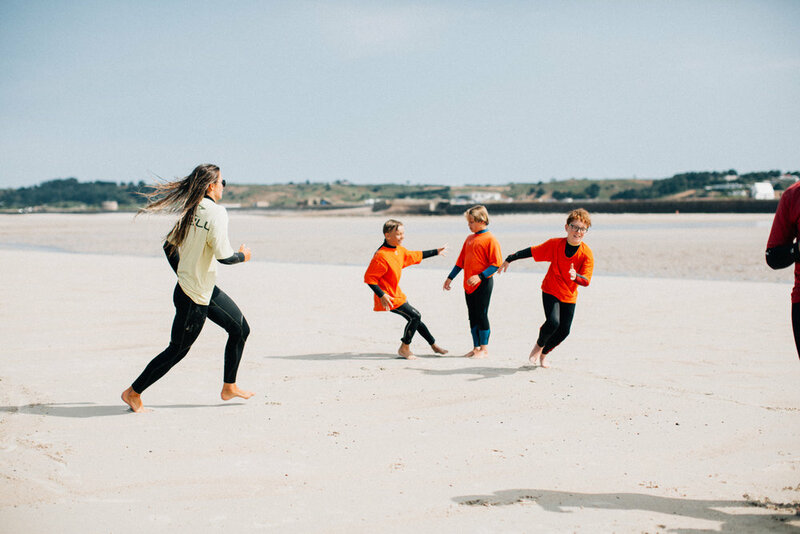 Being one of Jerseys top surf schools we were really happy to offer the free surf day to all the children throughout the island and we can't wait to have all them all back throughout the summer with the 2017 Splash Surf Centre Summer Camps! Our 2017 Summer Surf Camps are now online and ready to book! Check out the dates here and we look forward to seeing you at the Splash this Summer! Don't forget our first camp is our May Half Term one to get the kids ready with a taste of Summer Surfing!